Our first stop in the Terran system is a small planet that could only be described as the most beautiful sight in the entire solar system. Sparkling before us is a bright blue gem of dazzling complexity. Delicate white clouds dance above its surface of brilliant blues, greens, and browns. This is the planet Earth. It is the third planet from the Sun, and it is our home. Only slightly larger than Venus, Earth is the largest of the four terrestrial, or rocky inner planets in the Solar System. It is also the densest of the four. There are two very important factors that distinguish this planet from all others in the Solar System. 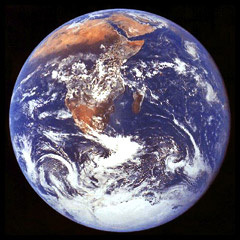 First, it is the only planet known to contain liquid water on its surface. It is the availability of this water that gives rise to Earth's second unique feature. It is the only known planet to support life! The surface of Earth is literally covered with water. 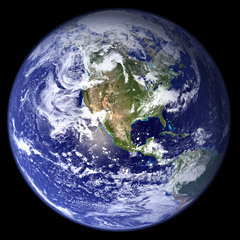 Nearly 3/4 of the planet's surface is liquid water. 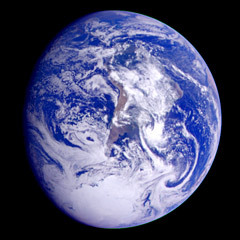 Water is also found in abundance as ice in the planet's poles and as water vapor in the atmosphere. Most of this water was thought to have been deposited by billions of years of volcanic activity. Some scientists believe that water may also have been brought to Earth by early comets. It is this water, combined with Earth's perfect distance from the Sun, that has given rise to the Solar System's only known life forms. The atmosphere also played an important factor, providing the right mixture of gases and helping to protect the surface from meteor impacts. Because of these perfect conditions, Earth has evolved an unimaginable diversity of millions of different life forms. 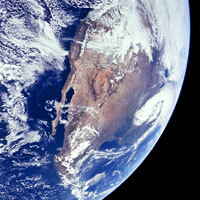 Life on Earth has adapted to all types of environments, including the land, oceans, and air. At least one of these has become self-aware and has begun to explore its surroundings. We humans have become the first form of life to leave their planetary home and explore the universe. Earth is a rocky world that is still very much alive and active. Volcanic activity continually creates new land while earthquakes reshape the landscape. 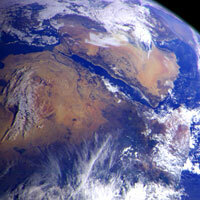 Earth's surface is constantly changing. The crust is divided up into several "plates" (somewhat like a cracked eggshell) that float on a sea of molten rock. Where these plates collide, the land is thrust upwards to create enormous mountain ranges. The tallest of these mountains, Mt. Everest, rises 29,028 feet (8850 m) above sea level. In some places, one plate sinks underneath another forming deep valleys and trenches. The deepest of these, the Marianas trench, plunges seven miles (11 km) beneath the sea. 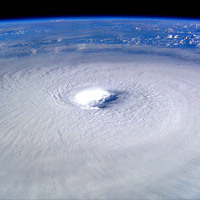 Uneven heating of Earth's atmosphere, combined with its rotation causes complex weather patterns. Wind and rain gradually erode the mountains and create vast sandy plains. Even though the planet was bombarded by asteroids and meteors throughout its early history, erosion has wiped out most of the craters. Some can still be found, however. Meteor crater in Arizona is over a mile (1.6 km) wide and almost 600 feet (183 m) deep. It is believed that large meteors may have caused mass extinctions throughout Earth's history. One of these may have been responsible for wiping out the dinosaurs. Although the planet may seem calm and tranquil now, its surface is highly active and ever changing on the wider geologic scale of time.